The sepulchral spirit of war memorials suffuses them with emotion and, accordingly, these memorials elicit a strong emotional response. Memorial visitors typically harbor great expectations of what the static collection of stone blocks and sculptures should evoke. These physical sites are expected to be participatory, interactive, and experiential despite their inherent inertia because they are tangible materializations of memory. Paradoxically, the official online sites representing the memorials, that have the potential to be truly interactive and participatory by creating a virtual “common space” where users could share their experiences, pictures, and emotions with other visitors and veterans, are neglected. The result, is that these virtual sites are as static, inexpressive, and emotionless as the fixed physical sites they represent. Interestingly, rather than displaying the memorials to best advantage, these sites display the reluctance on the part of many scholars and historians to enter into the digital age. Critics of internet scholarship often bemoan that “the Internet does not distinguish between the true and the false, the important and the trivial, the enduring and the ephemeral. . . . Every source appearing on the screen has the same weight and credibility as every other; no authority is ‘privileged’ over any other.” Yet, this neutrality is what makes a participatory online memorial an ideal democratic forum for remembrance, echoing the neutrality of an encounter with the physical memorial all while moving beyond the often disputed value of the statuary itself. First, adding a community conscious social networking ability, or at least a virtual message board, to the website could facilitate emotional reflection, memory sharing, and discourse that would serve as a facsimile for human connectedness. The internet being the most fundamentally democratic platform where members of an imagined community are able interact. The internet as the “great equalizer,” also re-emphasizes the non-judgmental nature of the physical memorial focusing instead on the universal and human understanding of war and nation. Second, memorials tell a story of historical heritage freed from the confines of the written word and linear narratives. In the same way, designers of a web memorial should not be limited to text. Dan Cohen and Roy Rosenzweig rightly wonder, why historians who have been “stuck with boring-looking texts” for so long, do not “revel in the freedom and artistic possibilities of the web.” So often, sites are designed down “to the point where it is simple to use but has lost its ability to convey profound thoughts and emotions.” It seems, that the greatest danger that a memorial website faces is the freezing and embalming of the experience in text. While the most common Yelp reflections for all the memorials refer to the solemnity, somberness, and sobering aspects of the memorials, the second most remarked upon aspect of the memorials was their ability to awaken empathy and arouse dialogue. In keeping with this, born digital experiences should be living, growing, evolving interfaces; collaborative projects that engage rather than instruct. As Will Thomas explained in a recent roundtable discussion regarding “The Promise of Digital History,” “Every presentation of the past is ‘chosen’ and a representation; indeed, narrative history is the most selective and digested. Digital history probably must be more ‘open’ to be effective.” So the superlative memorial website must share this “open” quality, where users have the ability to shape their own experience by choosing where to go and what to see, just as a visitor to the physical site can walk freely around the site. Text should, therefore, be minimal and “chunked” allowing for an experience that is both “participatory and spatial.” Following this example, in an ideal world, the homepage of each site would include three-dimensional virtual model to simulate an actual visit to the site, in which the user could “walk” through the space and view it from all angles. In addition to the quasi-religious, nationalistic significance of the memorial, the memorial is also expected to “preserve social ideals for future generations.” The ideal memorial, then, is both somber and social. This expected duality of purpose came arose from a heated debate that surrounded the societal role of memorialization at the end of World War I, and reignited after World War II. Traditionalists argued in favor of majestic, triumphal memorials which in their opinion properly commemorated glorious sacrifice, while the critics argued that “living memorials” that centered around democratic community life were an attractive alternative to “tawdry ‘monumental’ monstrosities.” Living memorials — dedicated libraries, parks, highways, community centers, and other civic projects—were thought to more “fluidly incorporate traditional memorial strategies…in terms of national identity.” The debate polarized the two aspects of the memorial and, as Andrew M. Shanken further explains in his examination of living memorials, “choosing a form of memorial was tantamount to choosing a form of society.” Most post-World War II communities overwhelmingly preferred memorials that emphasized living projects in contrast to seemingly useless, decaying, and vulgar tomb-like reminders of death. Digital media also differ from many other older media in their interactivity—a product of the web being, unlike broadcast television [or monograph, a two-way medium, in which every point of consumption can also be a point of production. This interactivity enables multiple forms of historical dialogue—[…] among people reminiscing about the past—that were possible before but which are not only simpler but potentially richer and more intensive in the digital medium. 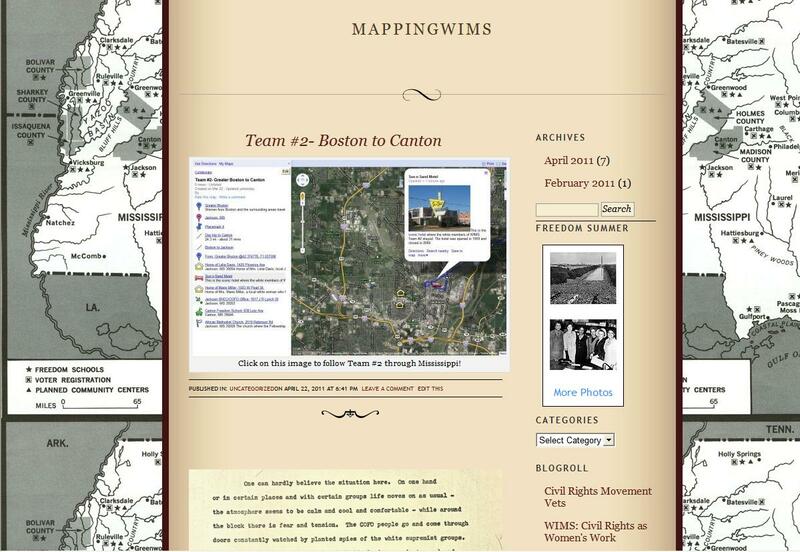 Many history websites offer opportunities for dialogue and feedback. Harnessing the interactive possibilities of digital media, social networking capabilities could be, and should be, incorporated into the online memorial presence. This can be done by utilizing existing social networking sites and platforms like facebook.com or emulating the reflective quality of a Yelp or TravelAdvisor site. In many ways, the interactive behaviors that users engage in on the Yelp site mirror the kind of public sharing and engagement that takes place at the physical memorial. In addition, including a Wikipedia-like section could allow veterans, family members, and site visitors (both physical and digital) to share their experiences, the stories of their loved ones, and post images. This interactive quality would reflect the evolving and “living” qualities so appreciated at the Vietnam memorial by allowing visitors and users to leave their mark of remembrance–personalized textual and photographic memorabilia, so to speak. Early proponents of the “living memorial” in the post-World War II debate often expressed grief over the excessive amount of money that was wasted on stone that could have been used to fund civil projects to advance humanity. Naturally, this debate does not apply in the case of physical sites in this instance since the memorials are already built, but that early desire to raise funds for “memorial causes” and scholarships would be a valuable addition to the National Parks Website. Online memorial websites have the potential to be fundraising sites for civic and national projects and scholarships. Using platforms like kickstarter.com or donorschose.com could allow people to raise money in honor of their loved ones. Sites like kickstarter.com, for example, is a website that allows people to pledge money for projects without infringing on intellectual copyright or obligating pledged donors to pay for projects that do not receive adequate funding. The meaning of the memorial is variable and never frozen in time and each of the memorials educes a unique response. So, too, should the websites be unique and variable. By determining how visitors engage with these memorials and their experiential expectations, we can see how the National Park Service might enhance their web presence by creating an interactive, participatory, and engaging multimedia experience that not only replicates but surpasses the physical encounter. Recognizing that the website, unlike the physical site, is something that anyone could visit from anywhere in lieu of a visit to the physical site, accentuates the need for a complete online experience. Properly utilizing digital media provides this advantage. Digital media has what historians Dan Cohen and Roy Rosenzweig call, “quantitative advantages—[website creators and historians] can do more, reach more people, store more data, give readers more varied sources; we can get more historical materials into classrooms, give students more access to formerly cloistered documents, hear from more perspectives.” Digital networks and platforms allow historians to reach to the largest possible audience, and allows this audience of users to interact more easily and cheaply than ever before; therefore, it is the most ideal and accessible medium for collaborative historical study. 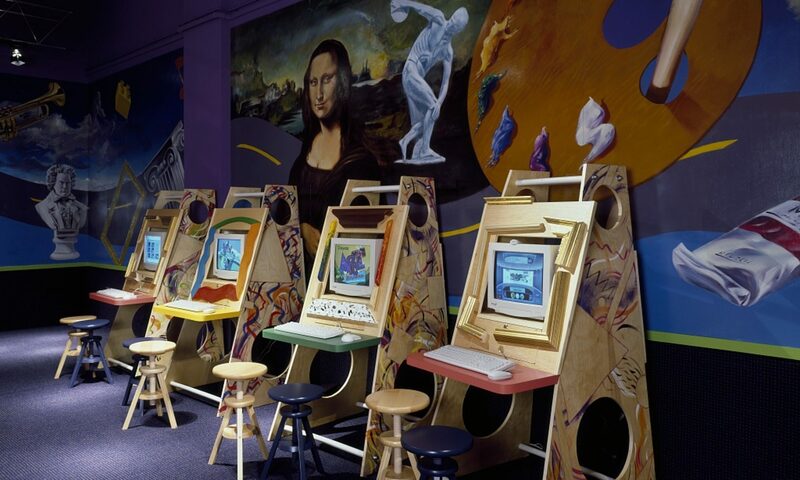 Website visitors, who would otherwise be unable either physically or financially to make a visit to the actual site would be able to experience and relate to the monument in a comparable, if not superior way. Naturally, websites creators and historians would need to exercise hyper-vigilance to maintain the historical integrity of the site, but with adequate oversight, a memorial website has seemingly limitless potential to serve as an educational tool for audiences of all ages and backgrounds. The suggestions for website improvement presented here are just the tip of the digital iceberg for understanding how new technologies can be developed and exploited to design a site that is both user-friendly and scholarly. Whereas the current websites merely reaches the audience and provide them with essential information, an improved web presence would also respond to the audience. Furthermore, taking advantage of cutting-edge web designs would not only rectify the disparity between physical and digital memorial sites, but would also potentially move the memorial experience beyond the marble and into living rooms and classrooms around the world. 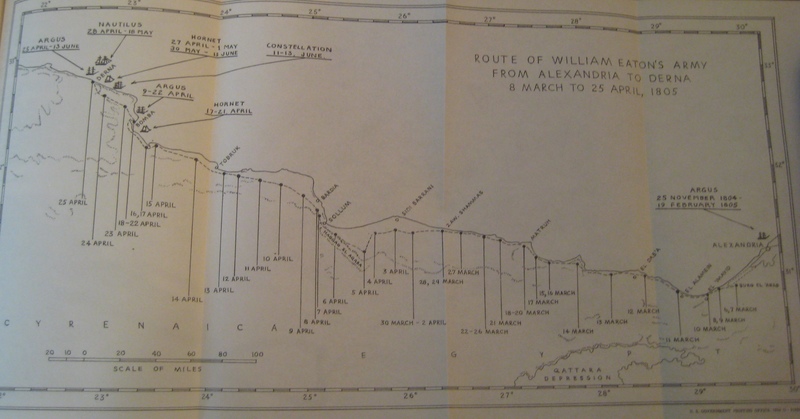 Shanken, Andrew M. “Planning Memory: Living Memorials in the United States during World War II,” The Art Bulletin, Vol. 84, No. 1 (Mar., 2002), pp. 130-147. 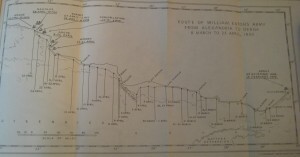 Route of William Eaton’s Army from Alexandria to Derne, 8 March-25 April 1805; prepared by the Office of Naval Records and Library. As I mentioned in my project proposal, my goals include reaching the public, having a forum to share my own research ideas, and generating discussion with others. The pages feature informative articles along with primary and visual sources; I want www.barbarywarfare.com to stimulate critical thinking about the events and show readers how historians create knowledge. Communicating Design was especially useful in helping me plan my website and spurring me to create personas to simulate my target audience. Fortunately for me, the definitive compilation of Barbary primary sources was published by the federal government, allowing me to freely include letters and pictures from this six-volume set without worrying about copyright restrictions. The collection has been digitized and is available for free at (http://catalog.hathitrust.org/Record/000367640), although the scans of the pictures are of poor quality. Thankfully, though, my HP Officejet 6500 features an awesome scanner! Regarding the technical details, I bought a domain name and web hosting services from DreamHost and downloaded WordPress software to use for constructing www.barbarywarfare.com. I selected a theme with a crisp, minimalist design and blue color (redolent of the ocean); I want this website to be easy-to-read and for the pictures not to compete with other graphics. For the header background, I chose a colorful and exciting painting from the mid-nineteenth century that depicts Stephen Decatur and Thomas Macdonough boarding a Tripolitan gunboat during the August 3, 1804 naval attacks. I also installed Disqus to run the comments section, as I want to make it easy for readers to link www.barbarywarfare.com to their Facebook and Twitter profiles since this amounts to free advertising. In order to maximize discussion and provide immediate context, I have comment sections on the bottom of each page. I also created a separate blog, which I will use to reflect on general questions about the Barbary conflicts and my own research as it progresses. What’s next? I’m passionate about this website and want it to impact a wide audience. As the Barbary Wars are rarely taught in middle and high school and college history courses, I plan to e-mail teachers and professors and tell them about my research and website. And as www.barbarywarfare.com includes a thorough bibliography of primary and secondary sources, I’ll mention that it can be a great resource for students working on their own projects (although the Barbary Wars are not often taught in school, students can still write about them for research papers). Also, I’ve included my website on my profiles on websites such as Facebook, Linkedin, www.academia.edu, and the various professional organizations to which I belong. Altogether, I’m proud of what I accomplished during this class, as building www.barbarywarfare.com has been and will continue to be an asset to my research portfolio. I continually want to refine my website and would appreciate any feedback! Creating a blog was a personal challenge for me. I shy away from putting personal information on the Internet, which has meant no blogging for me (perhaps there has also been a lack of interest). But, creating a blog based on history, with a little fiction tossed in, where few know that I am the writer, has allowed me really get into blogging and figuring out how to best put history on the internet in an easy and accessible way. My goal with this project was to bring more attention to Mary Anna Randolph Custis Lee and her experience surrounding Civil War. At Arlington House the history is focused mostly on Robert E. Lee, it is his memorial after all, but I feel that the history of women at Arlington House can be overlooked and that during the Civil War women played an important roll in society. Because of this I wanted to write about the history of a woman and Mrs. Lee turned out the perfect candidate. I have tried to stay true to her voice and her beliefs; because of this the blog can have a decidedly religious feeling about it sometimes. While class has ended, or has almost ended, this blog will continue and while I think the content has been interesting for the first few months it will become more interesting now that Lee has resigned. The blog will now be following Mrs. Lee journey from her family home to her final resting place Washington College, now Washington and Lee University. In a few days Mrs. Lee will be posting about how her husband is telling her she needs to leave her home and that will in turn bring to her mind memory of the house and of her family. I have enjoyed thinking about how to present Mrs. Lee’s history to the public and how to make the blog make sense. I want to present her family life and her intellectual life to the reader right as has she has to leave her family home because of the Civil War. It can be difficult to see her apart from her family because so much of her life was taken up with family and so in this endeavor I believe I have failed but I think that looking at her family life I have exceeded beyond my expectations. When writing about her family, her children and her husband, I think that Mrs. Lee’s personality comes through and that the reader can see how the Civil War begins to impact her life. Through the blog I hope readers can see how the Civil War impacted not just the soldiers, but the civilians removed from the war as well. Over all the blog has been much more successful than I ever imagined. I honestly thought that I might get a handful of views but people are consistently visiting the site. I have been pleasantly surprised. I am excited to see where the blog goes and where it ends up, whether or not I am the person finishing up the blog. I have really enjoyed the process and the current outcome of this project.